Have you ever looked into the faces of the people who call you “mom” and wondered what in the world you got yourself into? In other words, He wants you to be MomStrong! So if you’re feeling tired or inadequate today, get ready to find new strength as you join Heidi St. John in Becoming MomStrong. Dennis and Barbara Rainey have spent decades helping families find biblical help to strengthen and transform family relationships. Through radio broadcasts, conferences, and other events, they have been teaching on the foundations necessary for building godly families. Now they bring insights and expertise gleaned from those years of ministry, as well as from their own personal experience of raising six children, to The Art of Parenting. 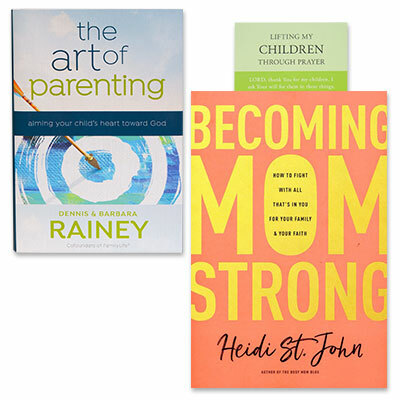 Expanding on parenting themes shared with FamilyLife audiences in person and on the radio, Dennis and Barbara offer trusted advice on how to establish Christian values in your home. When you apply biblical truths in these four areas, you can feel confident your children will have a foundation they can build upon for the rest of their lives. Prayer is powerful—because God, and our relationship with Him, is powerful. This easy-to-use prayer card equips you to bring your children to the God who sees, through prayers full of God’s own words from Scripture: prayers of character, purpose, and hope. For orders outside of the United States and Canada there may be additional shipping and handling charges. Please call 800-358-6329 7:00am to 5:00pm Monday through Friday for details. © Copyright FamilyLife®. All Rights Reserved. FamilyLife® is a 501(c)(3) nonprofit corporation and all gifts are tax deductible as allowed by law.